When the faithful enter moments of prayer or meditation, the picture presented to the world is one of solitude and self-focus—but the faithful themselves do this not only, or even mostly, to be alone, but primarily to experience connection to something larger than themselves. A great paradox of the human condition is that moments of private reflection often cultivate the most genuine and profound feelings of interconnectedness. Tuning into one’s own soul condition effects the need to express what’s found there, to share it with another person whose reception of the feeling makes it resonate, and adds meaning to it. 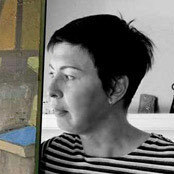 Bay Area painter Elena Zolotnitsky (b. 1961) needs quiet and isolation to produce her evocative paintings. To create, she withdraws. What adds more intrigue to her work is her equal determination to connect on a meaningful level with those who view her paintings. She is distanced, but far from disconnected. Born and raised in Moscow, Zolotnitsky studied art and animation at the Gerasimov Institute of Cinematography, where she received a rigorous training that included six years of painting and drawing. Watching films as part of her education and experiencing them as a kind of visual poetry deeply influenced Zolotnitsky’s approach to art-making. Work experience in the collaborative world of film also helped to determine her path—rather as an introspective and solitary painter. Her process revolves around transformation. In the tradition of Cézanne, she selects forms for their complexity and archetypal character, without concern for the inherent meaning of the subject. “My task is to subsume the subjects used into painting itself, so that we would not, for a moment, see them in their former utility, but as abstract fragments that interact to give a work its life,” says Zolotnitsky. "I can express my emotions by portraying a pear," she adds—bringing to mind Cézanne’s famous boast “With an apple I can astonish Paris.” The foundation of their work is the same: A thing painted is no longer the thing, but a painting. It says less, in the literal sense, but infinitely more by its associations. Zolotnitsky communicates with a smart visual lexicon informed by art history and aesthetic theory, and a wide range of influences surface in her work, from the Flemish school to Diebenkorn, Memling to Modigliani. More than literal reinventions, her paintings visualize the sensations and emotions she experiences when viewing the art she most admires. Past masters function as her vocabulary. She’s quick to quote their words, too: citing Robert Motherwell, she reminds us that "Every intelligent painter carries the whole culture of modern painting in his head. It is his real subject, of which everything he paints is both an homage and a critique, and everything he says is a gloss." Not just artists but the entire world around her inspires Zolotnitsky’s paintings—life experiences and memories, books and movies—and that points again to the paradox of her work. Though she creates in solitude, Zolotnitsky nonetheless aims to visualize authentic feeling that will resonate with others. She approaches her work trusting that honestly reflective, thoughtfully and artfully made paintings will find points of connection with other people. For one person to pour her soul into a painting, and for another to see that painting and be led to experience the same depth of feeling that led to its creation—that’s magic.